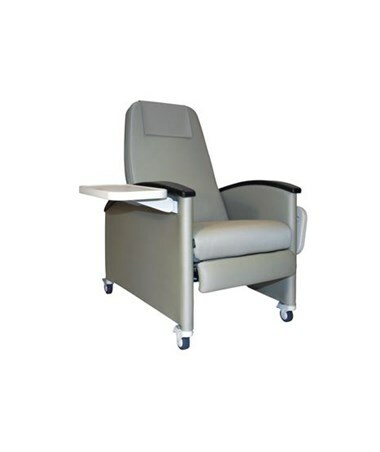 The Winco 6700/6704 Designer Carecliner has fully upholstered sides that add contemporary style, modern form and comfort for your patients. Durable and comfortable contoured urethane arms protect the upholstered finish while providing a sleek and modern style. With wide full support, uni-directional elastic band suspension system integrated into the seat andback frame, this chair provides exceptional comfort. 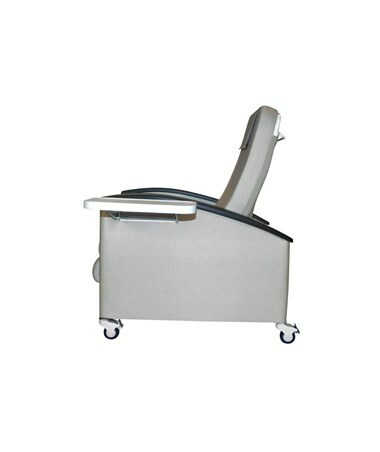 Standard Trendelenburg release on back has handles accessible from either side of the chair. The dual non-porous blow molded fold down side trays comes standard on each recliner. 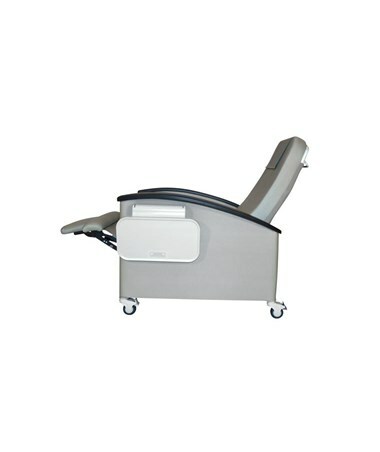 LiquiCell has been added into the seat of the Designer CareCliner for extra comfort. This ultra-thin, liquid-filled interface aids in improved blood flow, and helps prevent skin breakdown. The convenient release on the back of the Winco 6700/6704 Designer CareCliner allows for four position; upright, two reclining position and Infinite or Trendelenburg. The Designer CareCliner has a 350 pound weight capacity and meets Standard Fire Safety specifications. 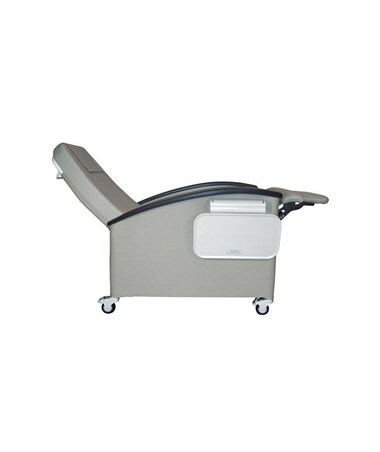 The 6700/6704 Designer CareCliner has a few options to better serve your needs. Please customize your CareCliner from the drop down lists on the right side at the top of the page unless otherwise noted. The 6700 Designer CareCliner features 3" Nylon locking casters that ensure ease of maneuverability. If you are looking for a home furniture look then the 6704 Designer CareCliner, which incorporates pedestal feet instead of casters, is for you. Enjoy the convenience of having an oxygen tank holder that attaches right to your 6700/6704 Designer CareCliner. The oxygen tank holder attaches on the right side of the chair. Please indicate in the drop down list at the top of the page whether or not you would like to include this feature. 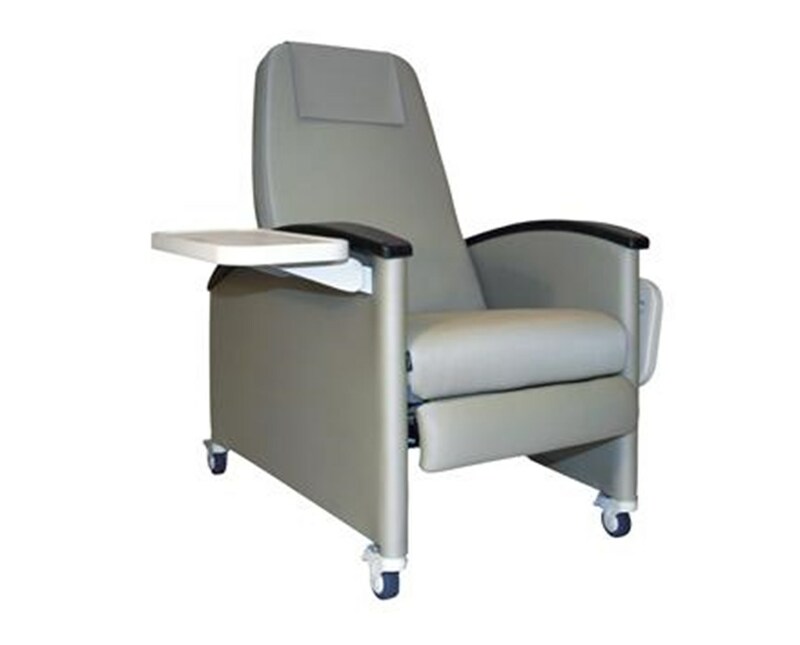 This option allows your fully upholstered 6700/6704 CareCliner to have an IV Pole that easily attaches to the chair. If you would like to include this option, please note it in 'Special Instructions' when completing your order. One of our sales representatives will contact you regarding pricing. All Winco 6700/6704 CareCliners meet Standard 117 Fire Requirements. If you would like the optional TB-133 which meets the requirements for California Technical Bulletin 133 -Flammability Test Procedure for Seating Furniture for Use in Public Occupancies, please note your preference in the 'Special Instructions' when you place your order and One of our friendly sales representatives will contact you regarding pricing.